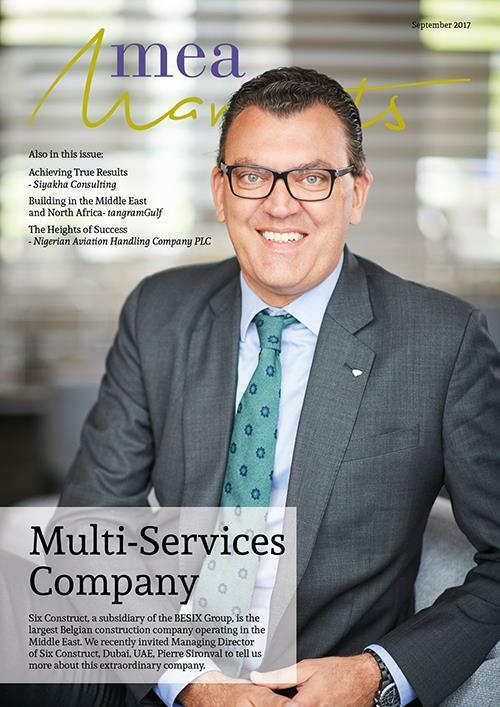 Welcome to the September edition of MEA Markets Magazine, providing the latest news, deals and developments across the Middle East and Africa. Gracing the pages of this issue is the largest Belgian construction company operating in the Middle East, Six Construct. The company’s Manging Director, Pierre Sironval, discusses the steady growth Six Construct has had throughout the years, as well as the unique portfolio the firm has built up over time. Speaking of building up a portfolio, Meinhardt Group have accumulated 60 years’ worth of trust, innovation and engineering excellence around the world. Providing an insight into the impressive scope of the firm’s work is Meinhardt Group’s CEO, Omar Shahzard, who reveals how the company have been a key player in emerging markets and Asia, since the 1970s. In recent news, MetLife announced it has signed a 3-year sponsorship agreement, MDRT (Million Dollar Round Table). The agreement will provide participation and support for the ongoing education, skills development alongside the exchange of marketing and sales practice for MetLife Asia’s financial services professionals and MDRT members in the Asia Pacific region. Elsewhere in this edition, we discover how the leading shopping mall, communities, retail and leisure pioneer across the Middle East, Africa, and Asia, Majid Al Futtaim unveiled the results of a first of its kind neuroscience study in the region on 10th September 2017. The study is designed to identify the most powerful drivers behind emotional attachment to urban developments and communities. Here at MEA Markets, we truly hope you hope you enjoy reading this issue and look forward to hearing from you.